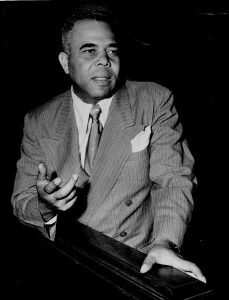 MINOR, NORMAN SELBY (19 July 1901-15 May 1968), noted criminal trial attorney under whom a number of Cleveland’s prominent black attorneys, including Merle McCurdy and Louis and CARL STOKES, trained, was born in Oak Park, Ill., to Arthur and Rebecca Walden Minor. He came to Cleveland when he was 4. After 2 years at the University of Michigan, he graduated with an LL.B. degree from John Marshall Law School in 1927, and was admitted to the Ohio bar in 1928. From 1928-30, Minor was associated with the firm of Payne, Green, Minor, & Perry, taking cases of men in jail who needed a free lawyer in order to gain trial experience. Appointed assistant Cuyahoga County prosecutor in 1930, he was assigned to cases in which the defendants were black since the discriminatory system at the time limited general use of his skills. 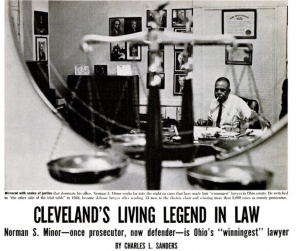 He worked effectively to change the policy for subsequent black prosecutors and, despite discrimination, became one of Cleveland’s best criminal trial lawyers. He prosecuted more than 5,000 felony cases, including 13 successful prosecutions for 1st-degree murder, his most famous case being that of Willie “The Mad Butcher” Johnson, convicted of murdering 12 women during the 1930s and 1940s. Involved in Democratic party politics, Minor polled the largest vote of any black candidate to that time in a 1937 election defeat for a municipal court judgeship. In 1948 Minor returned to private practice as a criminal defense lawyer specializing in homicide cases. Minor married three times and had two children. He had a son, Harold Craig (Green) Minor (b.1921-d.1988); a daughter, Valena (Williams) from the Feb. 1922 marriage to Grace C. Jones which ended in divorce in 1926. Minor married Norvell Major (d. 1937) in 1928; and in 1938, Minor married Mary Christian. He is buried in LAKE VIEW CEMETERY.